SCOTTSBLUFF — The City of Scottsbluff has taken the first step toward building a 5-megawatt solar electric station to provide more low-cost energy to its residents. At their Monday meeting, council members agreed on a location just south and east of the Landers Soccer Complex north of the city. Scottsbluff City Manager Nathan Johnson said the project will save the city about $500,000 in interconnectivity costs as there is already a transmission station in that area. 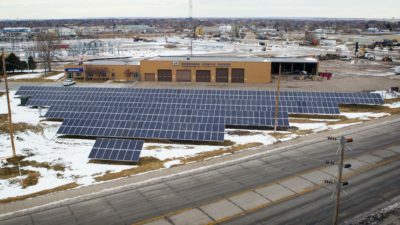 This entry was posted in Community-Scale Solar, Nebraska / Midwest News and tagged City of Scottsbluff, Nebraska Public Power District's SunWise Program, Nebraska's community-scale solar projects, Scottsbluff City Council, Scottsbluff City Manager Nathan Johnson on May 8, 2018 by Helen Deffenbacher.